Liver cirrhosis is a well-known illness as well as significant public health problem. Cirrhosis is a leading cause of morbidity and mortality in the United States. In that country, it afflicts more than five million individuals and is the seventh leading cause of death in adults between the ages of 25 and 64. The condition develops from long-term scarring and injury of that organ . There are many possible reasons for the infirmity. In the United States, it is most commonly the result of excessive alcohol intake or viral hepatitis. It may also occur from fatty liver disease, autoimmune conditions, bile duct disorders, and injury to the organ from drugs. Moreover, hereditary abnormalities can lead to it . Despite this distribution of the disease, a fifth of patients with it have cryptogenic cirrhosis in which its etiology is uncertain . The liver is the largest organ in the human body . Nevertheless, these clients suffer from fatigue, itching, jaundice or yellowish discoloration of the skin and swelling from fluid accumulation. In fact, there may be enlargement of the abdomen from excessive fluid there, and the physician may have to drain or remove a liter of it via paracentesis [1, 2]. The fluid accumulation in the abdomen can be quite ominous especially if an infection develops there. Such a scenario is spontaneous bacterial peritonitis, which is life-threatening [1, 2]. Further complications take place when these patients experience bleeding varices. These are essentially varicose veins of the gastroesophageal region of the body, and they are the result of portal hypertension. There may be blood clots in the portal vein, and this interferes with the flow of blood. The level of platelets in the bloodstream of these individuals is abnormal [1, 2]. The consequence of all this is bleeding from the varices which leads to hypovolemic shock. Naturally, there will likely be abdominal pain, and the medical team will have to replace loss of fluids and blood in order to save the client’s life [1, 2]. Many of these individuals develop hepatic encephalopathy in which ammonia and other waste products accumulate in the bloodstream. This leads to a decline in consciousness. However, the use of lactulose with other supportive measures has long been effective for this situation . The prevention and management of liver cirrhosis entails lifestyle change such as cessation of alcohol consumption as well as proper diet and exercise. When there is suspicion that the patient may have this medical condition, consultation with a gastroenterologist is necessary. Sanchez, W. and Talwalkar, J. (2012). Liver cirrhosis. Mayo College of Medicine. Ayoubieh, H. and Alkhalili, E. (2017). Another complication of cirrhosis. Cleveland Clinic Journal of Medicine, 84, 701-706. 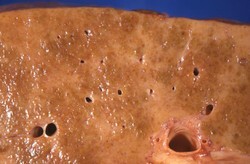 The photo shows a liver with scarring and fibrosis which are the result of chronic alcohol intake. Reprinted with permission from the U.S. Centers for Disease Control and Prevention. Copyright 2017 Michael Koger, Sr. All rights reserved. The information contained in this article is for educational purposes only and not for diagnosis or to guide treatment without the opinion of a health professional. Any reader who is concerned about his or her health should contact their physician for advice.